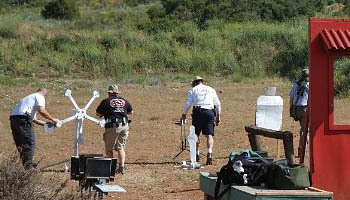 Linea de Fuego holds two USPSA pistol matches and one 3-gun match per month. Pistol matches are held on the second and fourth Saturdays of the month and the 3-gun match is held on the second Sunday of the month. Matches all follow USPSA safety, equipment, and scoring rules. We shoot outdoors at the North County Shootist Association Range on the Pala Indian Reservation in North San Diego County. Match scores are posted here, typically within one or two days after the match has been shot. You can get an email any time scores are posted by subscribing to our announcements email list. Three or four times a year, whenever the calendar gives us a fifth Saturday in the month, we hold the LdF Steel Match. Although the stage design and rules lean toward USPSA this is a great match for shooters in any of the competitive disciplines - USPSA, IDPA, Police, Cowboy, etc. We allow .22 (pistol and rifle) so bring the kids or a new shooter along. 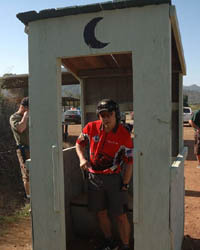 The match consists of a minimum of six USPSA style stages using only steel targets and the usual USPSA props (barricades, barrels, ports, etc.). If it's made of steel we shoot it - pepper poppers, round and square plates, movers, swingers, plate racks, Texas stars, and more. Round count is typically around 150, but bring plenty of ammo as steel is unforgiving. We recognize all USPSA pistol divisions, as well as both .22 pistol or rifle and shotgun (sorry, no magnums or .223). Because of the large turnout (100+ shooters) we start registration and squadding at 7:00AM. Shooter's brief is at 7:50AM and the range goes hot at 8:00AM. Match fee is $40 for the general public and $30 for LdF members. We have a vendor who will have food and drink available for purchase at the range. Your support of the food vendor will help ensure that they continue to return for future matches. If you're not planning to purchase food or drink you should bring something to drink as there is no running water at the range. Scores for steel match are posted to the Scores area of our website.